Dens invaginatus (DI) is a dental developmental abnormality in which the enamel organ is disorganized, leading to an invagination in the tooth crown before the calcification phase. The reported incidence ranges from 0.3% to 10% and the teeth most commonly affected are the maxillary lateral incisors. Oehlers's classification is the most widely recognized. Type I, characterized by the invagination confined within the crown, extending only to the cementoenamel junction; Type II, characterized by the invagination extending apically beyond the cementoenamel junction, where connection between the invagination and the pulp is possible; and Type III, characterized by the invagination extending beyond the cementoenamel junction and exhibiting a second foramen into the lateral periodontal ligament (III A) or peri radicular tissue (III B). The etiology remains unclear. Numerous theories have been suggested including altered tissue pressures, trauma, infection, and localized discrepancies in cellular hyperplasia. However, the more significant issue remains the correct diagnosis and subsequent proper management based on sound biologic and clinical principles. 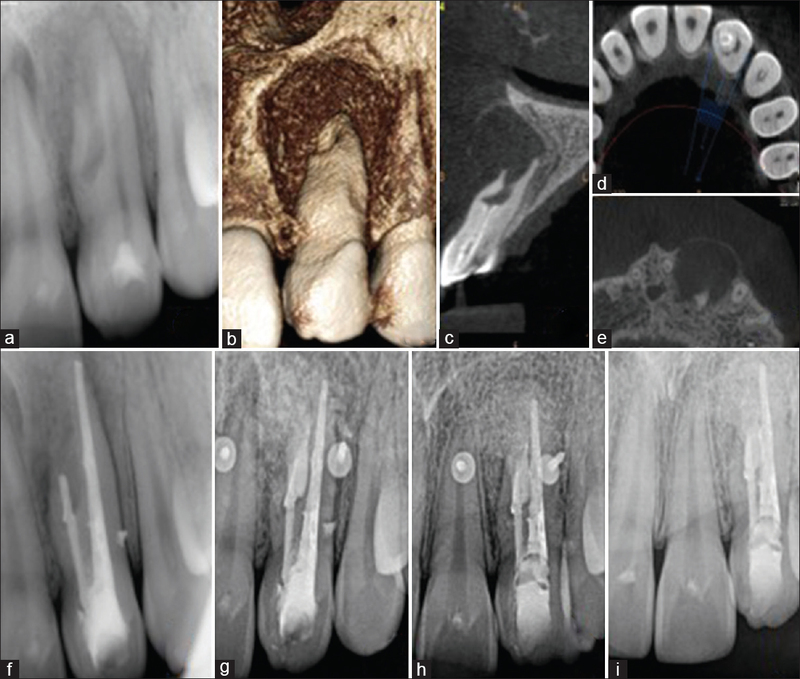 The following case report presents a case of Type III DI with apicomarginal defect and peri-radicular lesion, diagnosed with cone-beam computed tomography (CBCT) scan and treated with peri radicular (mineral trioxide aggregate [MTA] retro-fill) as well as periodontal surgery (guided tissue regeneration [GTR]). A 16-year-old female with a chief complaint of pain and pus discharge was referred for endodontic treatment of her maxillary left lateral incisor (#22). Clinical examination revealed no caries, no discoloration, normal tooth morphology and the presence of a fistula in relation to #22 [Figure 1]a. The tooth was mildly tender on percussion and recorded normal mobility. Periodontal examination revealed a deep pocket on the buccal aspect of the tooth #22. Remaining dentition revealed excellent gingival health. There was no history of previous orofacial trauma. Medical history was noncontributory. Pulp sensibility tests with refrigerant spray (Endo-Frost; Roeko, Langenau, Germany) and electric pulp tester (Digitest, Parkell Inc., Farmingdale, NY, USA) revealed negative response from #22. Radiographic intraoral periapical examination revealed Oehler's Type III DI and large radiolucent lesion in the peri-radicular area [Figure 2]a. To further confirm the diagnosis, the patient was referred for CBCT examination (CS 9300 Select three dimensional machine). Recommended imaging protocol was followed for the full field view ultra-low radiation dose scan. An invagination extended from the crown to the apex of the root (pseudo canal), with no evident communication with the palatally recessed main canal. Moreover, the main canal was associated with complete root formation. Ballooning and thinning of the buccal cortex was observed with resultant formation of the cystic lesion (1 cm × 1 cm × 1.4 cm in greatest dimensions) [Figure 2]b,[Figure 2]c,[Figure 2]d,[Figure 2]e. Bony defect encompassing the total root length was also noted (apicomarginal defect). A treatment plan of orthograde endodontic therapy followed by peri radicular surgery was decided and explained to the patient. Informed written consent was taken. The tooth was anesthetized, and access opening was performed with Endo Access diamond bur (Dentsply Maillefer, Baillaigues, Switzerland). The opening was modified to locate the pseudo canal. The main canal was found to be C shaped [Figure 1]b. Initial canal scouting was done with #10 K-file. Working length was verified with an apex locator (Mini Root ZX, J Morita, Japan). Shaping and cleaning were done with hand K files using step-back technique. Master, apical size for the main and pseudo canal, was #70 and #40 respectively. Circumferential filing with H file was also performed in the main canal. During instrumentation, 2.5% sodium hypochlorite was continuously used for irrigation of the canals. A slurry of calcium hydroxide powder mixed with saline was used as an intracanal medication. The access cavity was sealed with temporary cement. The patient was called after a week for the next appointment. The intracanal dressing was changed on each subsequent weekly visit until the time the intraoral sinus healed. Finally, after 2 weeks, the sinus healed. Final irrigation with 17% ethylenediaminetetraacetic acid was done, and the canals were dried with sterile paper points. Obturation was performed with lateral condensation technique using 2% Gutta-percha cones and AH plus sealer (Dentsply Detrey, Konstanz, Germany). 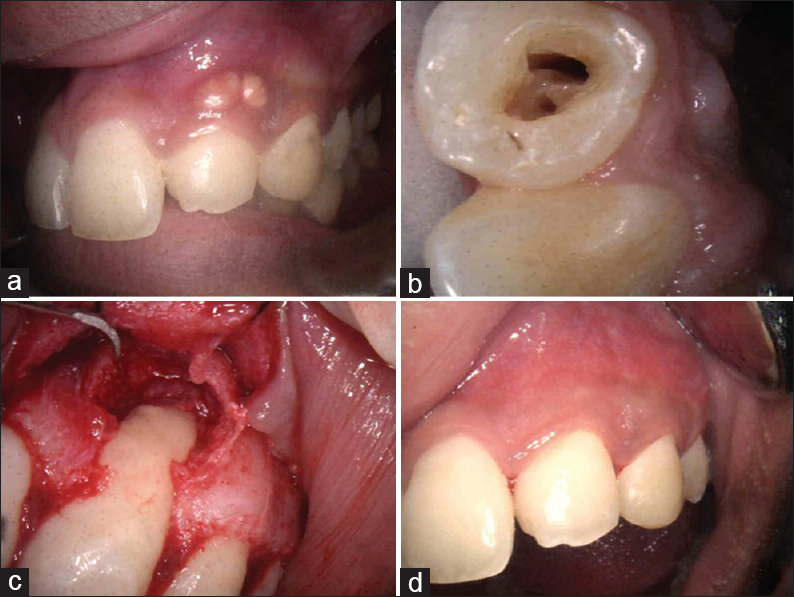 The access opening was sealed with composite [Figure 2]f.
For the surgical approach, after administration of local anesthesia using 2% lidocaine with 1:1,00,000 epinephrine, a labial full thickness rectangular mucoperiosteal flap was elevated to expose the area of the periapical lesion. The presence of apicomarginal defect along the labial root surface of #22 was confirmed [Figure 1]c. The existing pathological cortical bone window was widened with surgical burs to expose the lesion adequately. The granulomatous soft tissue surrounding the root was curetted thoroughly with surgical curettes. The rough borders of the root were smoothed and the undebrided part of the pseudo canal was cleaned with ultrasonics and retrofilling with ProRoot MTA (Dentsply Tulsa Dental, Tulsa, OK, USA) was done. Root resection was not done to maintain the original root length to help tooth stability. Later, the bony defect was condensed with synthetic bioactive glass (NovaBone Putty, Jacksonville, FL, USA). Once the defect was packed, bio-resorbable collagen membrane (Periocol-GTR™, Eucare Pharmaceuticals, Chennai, India) was placed around the bony defect along the root [Figure 2]g. Membrane fixation kit (Intakt®, Equinox, Netherland) was utilized to stabilize and secure the membrane in the desired place. The collagen membrane was secured with titanium mini-pins on the surrounding healthy bone. The mucoperiosteal flap was sutured completely without exposing the GTR membrane. Postoperative instructions were given to the patient and were recalled after 7 days for suture removal. Postoperative soft-tissue healing was uneventful and symptom-free. The patient was recalled in a period of the interval on 3, 6, 12, and 24 months postoperatively for clinical and radiographic evaluation [Figure 2]h and [Figure 2]i. The titanium pins were removed after 24 months through surgical re-entry. After 24 months, the patient was completely asymptomatic with normal gingival health [Figure 1]d. On periodontal evaluation probing depth was not evident indicating a positive sign of satisfactory healing. Various techniques and approaches to treating DI have been reported in the literature, including preventive sealing of the invagination, root canal treatment with or without periapical surgery, intentional replantation and extraction. There is a high incidence of pulp infection and degeneration associated with this anomaly, and because of this, Oehlers (1957) emphasized the importance of early diagnosis to prevent pulp necrosis and periapical inflammation. Endodontic treatment in teeth with DI, which extends up to the apical region and associated with apical pathosis, generally involves complicated procedures that require accurate diagnosis and appropriate treatment planning. Periapical surgery is indicated in cases in which conventional root canal therapy has failed, and in teeth that present anatomic variations that do not allow access to and cleaning of all the parts of the canal system, such as many cases of DI Type III with periapical lesions. In this case, surgery was required because of the complexity of the root morphology. Surgery provided an additional retrograde seal to the root canals, which may remain a source of irritation. Conventional radiographs are insufficient in most cases of DI as they show only a two dimensional view of complex anatomy. The use of CBCT imaging, obtained in three orthogonal planes (axial, sagittal, and coronal), is invaluable to observe the extent of the invagination and the relationship of the invaginated portion and the root canal with high precision. The use of CBCT was crucial in the treatment planning. Follow-up examinations did not include CBCT because of adherence to the ALARA (As Low As Reasonably Achievable) principle. Calcium hydroxide was used as an intracanal medicament in the root canal for a period of 2 weeks as its high alkalinity facilitates healing in necrotic teeth with the periapical lesion. In the present study, MTA was used as the retrograde filling material. It has been demonstrated that MTA induces the formation of a calcified matrix in the periapical tissue and regeneration of new cementum. It is the gold standard for retrofill because of its excellent sealing ability, biocompatibility, low solubility, and radio-opacity. An apicomarginal lesion is the most challenging situation in apical surgery, particularly when the buccal bone plate is completely missing. The main problem of an apicomarginal lesion is that healing is often characterized by epithelial downgrowth along the denuded root surface after apical surgery. Therefore, a long junctional epithelium forms along the root surface, with an increased risk of a recurrent communication between marginal and apical tissues. Hence, the GTR method is utilized to encourage the growth of key surrounding tissues while excluding unwanted cell types such as epithelial cells. GTR therapy has been implemented in the endodontic surgeries as a concomitant treatment during the management of the endodontic-periodontal lesions. The most common materials used to obtain regeneration into the surgical field are bone replacement grafts, barrier membranes and host modulating agents like platelet-rich plasma, all considered as tissue engineering. Bone grafts have osteogenic (autograft), osteoinductive (allograft), or osteoconductive (xenograft/alloplast) properties depending on the nature and processing of the graft. Bone grafts can be used to achieve favorable healing and regeneration of the defect area after degranulation. In endodontic surgical sites, these materials are employed with the intention to act as bone fills and scaffolds which facilitate wound healing, normal trabecular bone formation and prevent the proliferation of the oral epithelium into such defects ensuring the healthy clinical outcome. Recently bioactive glass was introduced in the putty form (NovaBone® putty) and the literature reports good confinement of the material. Bioactive glass has acquired interest because of two properties: osteoconduction and osteoproduction. They can cause acceleration in acellular mineralization and bring about stimulation of cell responses by releasing ions such as calcium and silicon at proper doses. Bioactive glass can bond directly to the bone through the development of a surface layer of carbonated hydroxyapatite in situ. It has been shown to significantly increase clinical attachment level and hard tissue fill when implanted in intrabony defects. NovaBone® putty is a next-generation calcium phospho-silicate bone graft material built from a bioactive glass platform with additives that improve handling characteristics and performance. The advantage of the putty form of bioactive glass is that it contains glycerine and polyethylene glycol which makes the glass particle coherent and thus enhancing handling characteristics and minimal migration of graft particles from the defect site. Histological evaluation of material has shown that the particulate tends to retard the down growth of epithelial tissue. Various collagen barriers of mammalian origin such as bovine and porcine have been used successfully for GTR. Recently, interest has been developed in nonmammalian collagen sources, primarily fish collagen. A bioresorbable collagen barrier membrane (Periocol®) of fish origin has been developed for GTR applications in human periodontal intrabony and furcation defects. Periocol® collagen membrane has been used as a sustained release chlorhexidine chip in chronic periodontitis patients and reported to resorbed after 30 days. Considering the large size opening of the cystic defect, titanium minipins were used. Application of titanium minipins prevented the mobility and collapse of the membrane, thus facilitating space maintenance. The minipins thus facilitated to achieve a secured seal allowing a crease-free transition to the periosteum. Assessment of success or failure after peri radicular surgery is based on clinical and radiographical criteria. The patient showed uneventful healing and improvement in the status of the tooth-supporting structures after a follow-up period of 24 months. The present case thus highlights the successful outcome of a case of DI Type III associated with apico-marginal defect treated by combined endodontic therapy and peri-radicular regenerative surgery. We would like to thank the patient who participated in the case report. Fregnani ER, Spinola LF, Sônego JR, Bueno CE, De Martin AS. Complex endodontic treatment of an immature type III dens invaginatus. A case report. Int Endod J 2008;41:913-9. Reddy YP, Karpagavinayagam K, Subbarao CV. Management of dens invaginatus diagnosed by spiral computed tomography: A case report. J Endod 2008;34:1138-42.
da Silva Neto UX, Hirai VH, Papalexiou V, Gonçalves SB, Westphalen VP, Bramante CM, et al. Combined endodontic therapy and surgery in the treatment of dens invaginatus type 3: Case report. J Can Dent Assoc 2005;71:855-8. Ranganathan J, Rangarajan Sundaresan MK, Ramasamy S. Management of oehler's type III dens invaginatus using cone beam computed tomography. Case Rep Dent 2016;2016:3573612. Alani A, Bishop K. The use of MTA in the modern management of teeth affected by dens invaginatus. Int Dent J 2009;59:343-8. Sánchez-Torres A, Sánchez-Garcés MÁ, Gay-Escoda C. Materials and prognostic factors of bone regeneration in periapical surgery: A systematic review. Med Oral Patol Oral Cir Bucal 2014;19:e419-25. Chan C, Thompson I, Robinson P, Wilson J, Hench L. Evaluation of bioglass/dextran composite as a bone graft substitute. Int J Oral Maxillofac Surg 2002;31:73-7. Froum SJ, Weinberg MA, Tarnow D. Comparison of bioactive glass synthetic bone graft particles and open debridement in the treatment of human periodontal defects. A clinical study. J Periodontol 1998;69:698-709. Bansal A, Kulloli A, Kathariya R, Shetty S, Jain H, Raikar S, et al. Comparative evaluation of coronally advanced flap with and without bioactive glass putty in the management of gingival recession defects: A randomized controlled clinical trial. J Int Acad Periodontol 2016;18:7-15. Naqvi A, Gopalakrishnan D, Bhasin MT, Sharma N, Haider K, Martande S, et al. Comparative evaluation of bioactive glass putty and platelet rich fibrin in the treatment of human periodontal intrabony defects: A randomized control trial. J Clin Diagn Res 2017;11:ZC09-13. Singh VP, Nayak DG, Uppoor AS, Shah D. Clinical and radiographic evaluation of nano-crystalline hydroxyapatite bone graft (Sybograf) in combination with bioresorbable collagen membrane (Periocol) in periodontal intrabony defects. Dent Res J (Isfahan) 2012;9:60-7. Kirsch A, Ackermann KL, Hurzeler MB, Durr W, Hutmacher D. Development and clinical application of titanium minipins for fixation of nonresorbable barrier membranes. Quintessence Int 1998;29:368-81.